I first heard about Dog Mountain six years ago when my mom and I happened upon his book The Dog Chapel when shopping in The Village Book Store in Littleton, NH. We bought the book on the spot and knew we had to make the drive (which isn’t that far from our condo in Bretton Woods; maybe an hour tops). Over the years we’ve been back many times; each time bringing Tucker and Lily who find a peace there that they haven’t found anywhere else. When I say Steven Huneck is an amazing man I truly mean it. 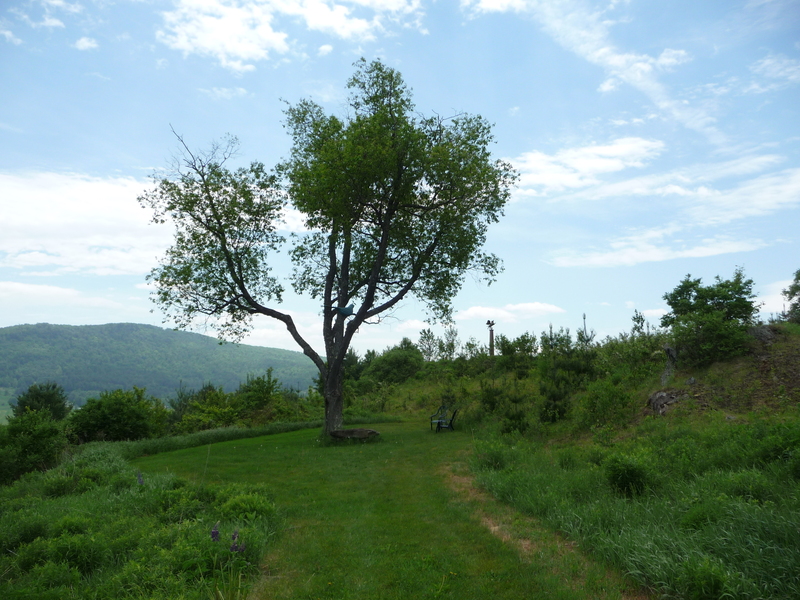 Dog Mountain sits on countless acres of land in St. Johnsbury, Vt and houses Huneck’s gallery /gift shop as well as ponds for dogs to go swimming in. But the centerpiece of dog mountain is the chapel. The Dog Chapel can best be described as a spiritual center for dog lovers. In short it’s a memorial for dogs lost but never forgotten. The walls of the chapel are covered in photographs and memories left by people grieving the loss of their dog, which to a dog lover, is the single most important member of the family. I got to meet Huneck once at a signing at the Littleton Book store and was able to tell him how much he impacted my life through his work and passion. Never have I had the pleasure of being in a place so beautiful. The chapel puts life into perspective and make you cherish every moment. To think that one man would think to create a place for dogs to be remembered makes Huneck my hero. He always knew what was really important in the world. I’ve always said that I don’t crave becoming a father like most people do; instead I crave a life where I always have dogs around me. Huneck got that and on a mass scale. He has helped to unite the world through their dog; I couldn’t ask for anything more. I will always wonder how I made it through four years of college without seeing Lily every day. Now, I can’t get enough of her. Now, when I leave the house, I can’t wait to come home and be with her. That’s how much she means to me. This past January, the morning we left on our vacation to Turks and Caicos, we got word of the unthinkable. The economic crisis effects all of us in different ways and some more severe than others. For Huneck it meant laying off all his workers; a decision that left him a changed man. Unable to deal with the life he had worked so hard to create crumbling around him; Huneck, sitting in his parked car outside his psychiatrists office, killed himself (Read about his life and death, here). And her vision came true in spades. Never have I been to a memorial service more peaceful or beautiful. The day was special and brought together all who enjoy Huneck’s work and the dogs who call the place home. Before the events began my mom, Lily, and I walked the trails and let go of Tucker. Four years ago on the Friday of my first Family Weekend of college, we lost the dog who defined my childhood. Tucker was far more than just a four-legged pet who shed fur throughout our home. He understood us in a way no one else ever has or will. When I was a lot to deal with (oh yes, I had my moments), Tucker would know how I was going to behave hours before I would act up. He got me. Of course, his bigger alliance was to my mom; the one person had the deepest connection to. He would only react to her commands and he was her protector during his thirteen years on earth. As far as watch dogs go, Tucker was among the best. His ability to turn into 100 pounds of dead weight when a person entered the house he didn’t get positive vibes from was remarkable. His family came first no matter what. Tucker is a Sawtelle dog through and through. The bond I (and my mom) had with him was akin to that of Edgar and Almondine. It is strange how a dog can just get you. I swear they have amazing powers. We found a tree up on the hill all by itself overlooking the valley and dog mountain and let go of his ashes. It was a moment for my mom who did it herself. In that moment dog mountain became more than just a place to visit but one we have a personal connection to. After letting go of Tucker we were able to make sense of the day and celebrate the life Huneck had lived in the magical place he created. It’s sad to get in death what you can’t get in life. For some people, the acceptance they need to know their live mattered only comes after death; when everyone realizes what their truth worth. If Huneck’s death teaches us anything, it’s that we need to tell people how much we care about them while they are still around to hear it in person. There isn’t a doubt in the universe that Huneck heard the beautiful words the speakers had for him but to have heard them in person would’ve been the icing on the cake. The service was lead by a preacher who navigated the audience through song and remembrance. What made the service so great was the informality of it. In the way Huneck would’ve wanted it, the dogs and people were gathered on folding chairs on a hill overlooking the chapel and gallery. Dogs would run around as they were allowed to be free; often running behind the makeshift pulpit and in and out of the pond. After opening remarks, the preacher played the Beatles classic “All You Need Is Love” and suggested to the audience they sing along. You would’ve thought it 1966 and the four member band was exiting their plane and landing in America for the first time. There wasn’t a dry eye when everyone sang the words to the powerful song. Following a moment of silence the pulpit was converted into an “open mic” where anyone could come up and share their memories of Huneck and let the world know what he meant to them. The first couple were planned; beginning with one of Huneck’s workers. Being an artist it was apparent he was shy and he spoke in a monotone voice but none of that mattered. He told of his life working with Huneck and how Huneck became a father figure to him; something he wasn’t blessed with at home. Never had something come more from the heart and put the whole day into perspective. The artist reiterated the message of the day. He didn’t realize how much Huneck meant to him until he was gone. It’s in those moments, when he loose the one person who we never think will die, that we take stock of our own life and realize just what is important. We think that gaping hole inside us will never be filled but find out just how strong we really are. We’re meant to have only so much time with somebody. For the artist, who is just a kid himself, Huneck meant more to him than any other person. Other speakers were family members of Huneck including his sister. After someone read from the memorial books we are all signing; I thought it time to go. I had taken in as much as I could for one day. 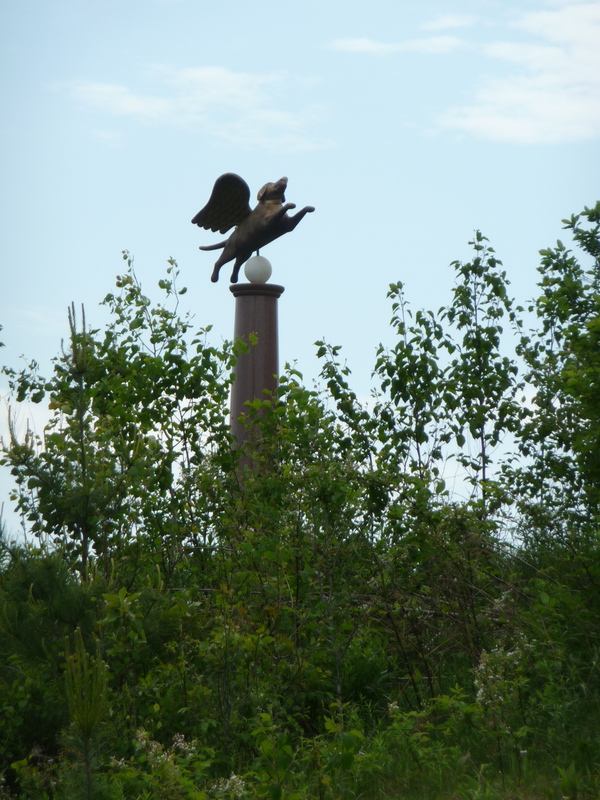 In my absence the service continued with a walk up the hill with all families and their dogs; up the hill to the highest point on property where Huneck erected a dog with angel wings sitting atop a flag pole and a gate into heaven. A fitting end to a service celebrating the life of an amazing man. If you’re a dog person, and who isn’t, it is worth the trip to journey to 143 Parks Rd in St. Johnsbury Vt and visit Dog Mountain. Bring your dog (or dogs) and make a day of it. Never will you be in such a spiritual place again. The admission is free; all money is made through purchases in the gallery/ gift shop. Check out the website for more information: http://www.dogmt.com.